This is the first big update for Windows 10 (Version 1511, Build 10586). It brings new features, UI refinements and performance enhancements to users. One of the big changes in this update is the new colored title bar for desktop apps. You can notice the UI improvements in the Start menu, context menu and other areas as well. The new update is installed via Windows Update service. 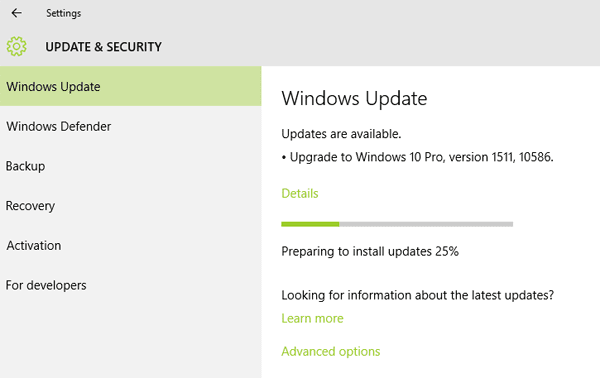 So check it by going to Settings -> Update & Security -> Windows Update. If you have not found the update, check and do the followings. 1. First, make sure your system is up to date. If not, install all the KB update left and restart your computer. Then check Windows update for the new software update. 2. If you have upgraded your Windows 7/8.1 to Windows 10 less than 31 days ago, then you have to wait more times to get the new update, because this is the grace period for downgrading your OS. 3. If you have enabled ‘Defer upgrades’ option, you will not get the software update right away, though you will get the security update. If ‘Defer upgrades’ option enabled, disable it as given below. This is applicable to Windows 10 Pro or Enterprise editions only. b) In the Group Policy Editor, go to Local Computer Policy -> Computer Configuration -> Administrative Templates -> Windows Components -> Windows Update. c) Double click ‘Defer Upgrade’ to see it is enabled. Check the box next to ‘Disable’ and click OK. Close the Group Policy Editor. d) Restart your computer and go to Windows update. You should see the new software update. Note that, you can also download the new Windows 10 using the Media creation tool and update your computer or create a bootable USB drive to install it later.